The wind had calmed by the time I woke up. 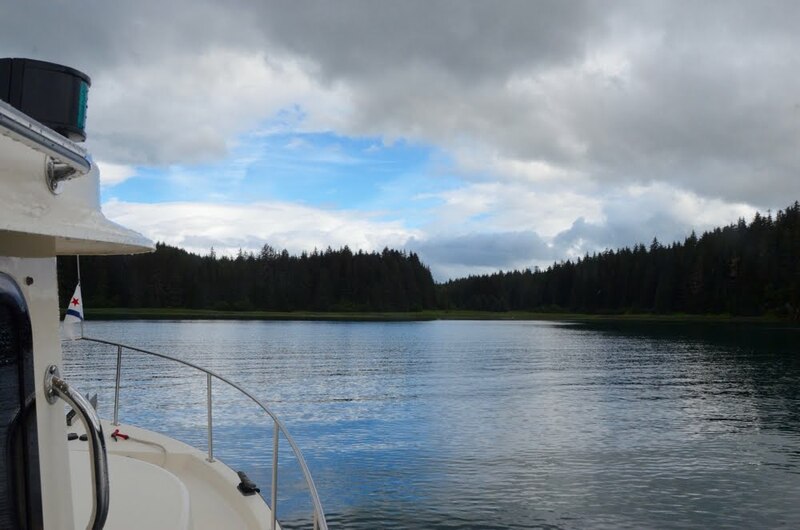 We had a lazy morning in Sawmill Bay and headed out around noon. Kevin and Laura went to Gustavus to pick up their friends Tiffani and Deke and I headed to Flynn Cove. Flynn Cove is on the north shore of Chichagof Island, just a few miles west of Port Frederick. Despite the calmer conditions in Sawmill Bay, Icy Strait was still pretty rough. And my course from Excursion Inlet to Flynn Cove put the seas directly on the beam. The salon table isn’t permanently attached to the floor, and a few times each year the conditions are bad enough that it ends up upside down. Today was one of those days. Nothing broke, though, and it was only rough for an hour or so. Flynn Cove was totally calm. I dropped the anchor near the head of the bay in about 50 feet of water and had a lazy afternoon. Kevin and Laura arrived in the evening with their friends, Tiffani and Deke. They rafted to my boat and we had a late dinner. Tomorrow we head to Hoonah for a flightseeing trip of Glacier Bay.